Having been farewelled at a large Assumption Day Mass in Quebec, next week sees Cardinal Marc Ouellet depart Canada's Premier See for Rome and his place in the Vatican's "Big Three" as prefect of the Congregation for Bishops. The first Canadian ever tapped to head a Roman Congregation, and the first North American to be given the keys to the all-powerful "Bishops' Shop," the incoming Kingmaker and chief overseer of the global church's 5,000-odd prelates marked the transition with one of his favored pasttimes -- a round of interviews -- along the way shedding some light on the qualities he'll be seeking in recommending candidates for the high-hat to B16 at their weekly Saturday sit-downs. We are in a world where the Christian heritage being strongly contested, so we have to recognize that and propose it better, though not through an attempt to restore the past, he said. “If you state it only formally and in the end you do not really want to see it applied because you don’t believe that it is possible that people accept it, you are in trouble for the transmission of the message,” he said. 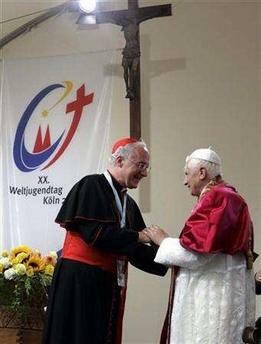 Bishops must also be close to people, he said. Being spiritual does not mean keeping a distance. “I believe deeply there will be a new evangelization,” he said. “We need intellectuals for that, theologians, philosophers, Christians who really believe in the Gospel and share the doctrine of the Church on moral questions,” he said. As Ouellet succeeds the quintessential Vatican operative who's kept the trains running on time, perhaps the best nutshell assessment of his desired skill-set is that he'll be seeking out "movers, not managers." "The task of sanctifying that you have received obliges you in addition to be promoters and animators of prayer in the human city, often chaotic, noisy and forgetful of God: you must create places and opportunities for prayer where in silence, in listening to God, in personal and community prayer, the person can encounter and have a living experience of Jesus Christ who reveals the authentic Face of the Father. Parishes and shrines, areas of education and suffering and families must become places of communion with the Lord. Lastly, as guides of the Christian people, you must encourage the participation of all the faithful in building the Church, in governing with the heart of a humble servant and an affectionate Pastor, aspiring to the glory of God and the salvation of souls. By virtue of the task of governance the Bishop is also called to judge and discipline the life of the People of God entrusted to his pastoral care through laws, directives and suggestions, as the universal discipline of the Church prescribes. This right and duty is very important if the diocesan community is to remain inwardly united and to walk in sincere communion of faith, love and discipline with the Bishop of Rome and with the whole Church. Therefore do not tire of nourishing the faithful with the sense of belonging to the Church and the joy of fraternal communion. However, the Bishop's governance will be pastorally effective only if "it rests on a moral authority bestowed by his life of holiness. This is what will dispose hearts to accept the Gospel that the Bishop proclaims in his Church, as well as the rules which he lays down for the good of the People of God" (ibid., n. 43). Consequently, moulded from within by the Holy Spirit, may each one of you become "all things to all men" (cf. 1 Cor 9: 22), proposing the truth of the faith, celebrating the sacraments of our sanctification and witnessing to the Lord's charity. Accept with an open heart all who knock at your door: advise them, comfort them and support them on God's path, seeking to guide them all toward that unity of faith and love of which, by the Lord's will, you must be the principal and visible foundation in your dioceses." 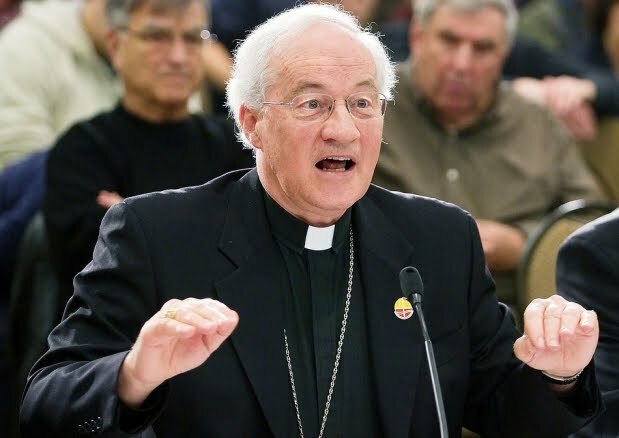 Like Pope Benedict, Cardinal Ouellet believes that many Catholics interpreted the teachings of Vatican II as far too liberal and by doing so disconnected from the core of their faith. Unfortunately, he said, it led to priests abandoning celibacy, a drop in proper religious education and a general infusion of leftist politics — all of which was not the intention of the council. One of the defining features of Ouellet’s style is his habit for generating controversies. In May of this year, for instance, while supporting the federal government’s international maternal health-care initiative—a project that will not fund abortions in developing countries—the cardinal lamented that abortion was a “moral crime.” The media understood his words to be rallying call for the recriminalization of abortion, even though he neither said nor implied as much. The Supreme Court of Canada struck down the abortion law in 1988 and nothing has replaced it. No Prime Minister—from the Catholics Jean Chretien and Paul Martin to the Evangelical Stephen Harper—dared to reintroduce legislation, leaving Canada as one of the few nations with no abortion law. The cardinal’s comments were neither incendiary nor surprising. But, unlike his brother bishops who understand the difficulties of the terrain, move gingerly through the minefields, and try to rebuild credibility as religious leaders in a secularizng world, Ouellet plunges in where even angels fear to tread. The extreme reactions he elicits have become a defining feature of his leadership. A recent poll has shown that 94 percent of Quebeckers oppose Ouellet’s position on abortion. His episcopal colleagues are aware of the polls. They understand that an effective strategy for consciousness-raising requires rebuilding the church’s credibility in a province that has—in a generation—moved from being as Catholic as preconciliar Ireland to being as secular as France. Yet, Cardinal Ouellet, in spite of his capacity for stirring resistance, is approachable, personable, and a man of deep faith. I spent time with him a couple of years ago when he came to the parish of St. Francis de Sales in New Brunswick. He was presiding at an anniversary Mass of uncommon liturgical beauty. The choir sung superbly. There were liturgical dancers—and even altar girls. It was an elegant rite defined by a deep festive spirit. Ouellet was clearly in his element, delivered a homily in eloquent French, and effortlessly mingled with parishioners. If he brings those pastoral and spiritual sensibilities to bear in his new role as “bishop-maker,” Catholics worldwide will benefit. Yes, candidates he recommends will be ecclesiologically conservative, but, one hopes, neither doctrinaire nor unapproachable. In other words, like the man who helped to choose them, Ouellet’s bishops will be real pastors. While some of his provincial confreres have seen fit to critique the new Prefect on his passage, it bears repeating that a majority of Quebec's 19 dioceses will open over the next two years as its occupants reach the retirement age of 75. Leading that list is the 1.6 million-member Montreal church, where Cardinal Jean-Claude Turcotte hits the milestone next June. Meanwhile, alongside the choice of his own successor at the helm of Quebec City's million-member fold, likewise already on the docket is a new head of Anglophone Canada's third-largest see: Ontario's 560,000-strong Hamilton diocese, where Bishop Anthony Tonnos turned 75 earlier this month (...and whose auxiliary, according to one local report, "would welcome being considered" for the chair). "This Is How a Bishop Serves"
"To Serve, and Not to Be Served"